College kids everywhere are stocking up Four Loko and other beverages containing caffeine and alcohol – two staples for many university students’ diets – as the U.S. Food and Drug Administration (FDA) aggressively moves to eliminate the high-potency drinks from the market because of safety concerns. 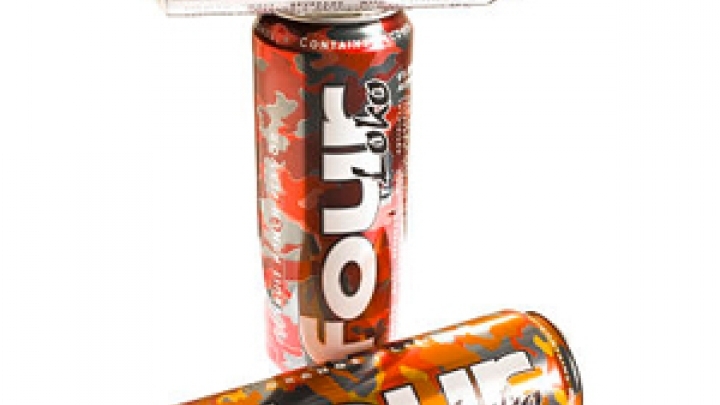 The FDA sent letters to Four Loko producers and three other makers of alcoholic-caffeinated beverages basically forcing them to halt sales within 15 days. The agency cited caffeine as an “unsafe food additive” to the alcoholic drinks. Consumers meanwhile have raided liquor stores this week to buy the last remaining rations of Four Loko and similar drinks that pack as much alcohol as an entire bottle of wine into a 23.5 ounce drink. The jolt of caffeine in the beverages, known as “blackouts in a can,” allow consumers to consume far more alcohol than they normally would because of the caffeine’s stimulating effects. The drinks create a “wide-awake drunk” feeling. The FDAs actions arrive in the wake of a series of high-profile incidents involving the beverages. Students at Central Washington University and Ramapo College in New Jersey were rushed to emergency rooms recently, some with alcohol poisoning and another near death. The drinks have been blamed for other deaths and fatal car crashes. Phusion Projects, the makers of Four Loko, have agreed to remove caffeine and other substances from its products. Spokespersons for JOOSE, another caffeinated alcoholic beverage, said they had not seen “known reports of any health or safety incidents” involving its products and would continue to market them while complying with alcohol-regulatory officials and legislators. The FDA’s actions arrive on the heels of a recent study claiming energy drinks are strongly associated with increased risks for heavy drinking and alcohol dependence. The study claims that individuals who consume 52 or more energy drinks within a year are at a significantly higher risk for alcohol dependence and episodes of heavy drinking, statistically speaking. The study’s lead author, Amelia M. Arria, director of the Center on Young Adult Health and Development at the University of Maryland School of Public Health, said researchers were able to examine whether energy drink use was still associated with alcohol dependence after controlling for risk-taking characteristics. “The relationship persisted and the use of energy drinks was found to be associated with an increase in the risk of alcohol dependence,” Arria said. It’s no wonder many college students who like to take the edge off while staying alert and on-the-go favor JOOSE and Four Loko, which provide both effects with one drink. About 65 percent of Americans consume alcohol, making it another popular drug of choice. Alcohol has widespread effects on the body, affecting the central-nervous system, blood pressure and internal organs such as the liver, which processes alcohol. Combining alcohol (a depressant) and caffeine (a stimulant) has resulted in life-altering consequences, and you can see why. With the FDA’s recent regulation, however, those devastating effects will hopefully stop.